Hosting a party for your child this fall? Here are the best insider tips from New Jersey party experts Adrienne & Amy of The Boastful Host. Tailored specifically to busy parents! The Boastful Host was founded by two New Jersey moms, Adrienne Kalinauskas and Amy Macauley. They wanted to bring their passion for food, crafting, and organization to those parents looking to throw parties that are personal, with all fun details, but who just don't have the time to pull it all together. They customize their planning services to meet the needs of each individual client. They work with your vision to bring your party to life, developing a concept unique to your party, offering handcrafted decorations, personalized menu planning, recommendations for engaging activities, and so much more! Clients receive a step-by-step "Party Design" with all of the tools needed to execute your party quickly and with minimal effort, maximizing your time, energy, and budget. With the fall leaves comes the start of school, new friends, new gatherings, and some of our favorite holidays. From Halloween to the New Year, there are a ton of excuses to throw a great party for your family. 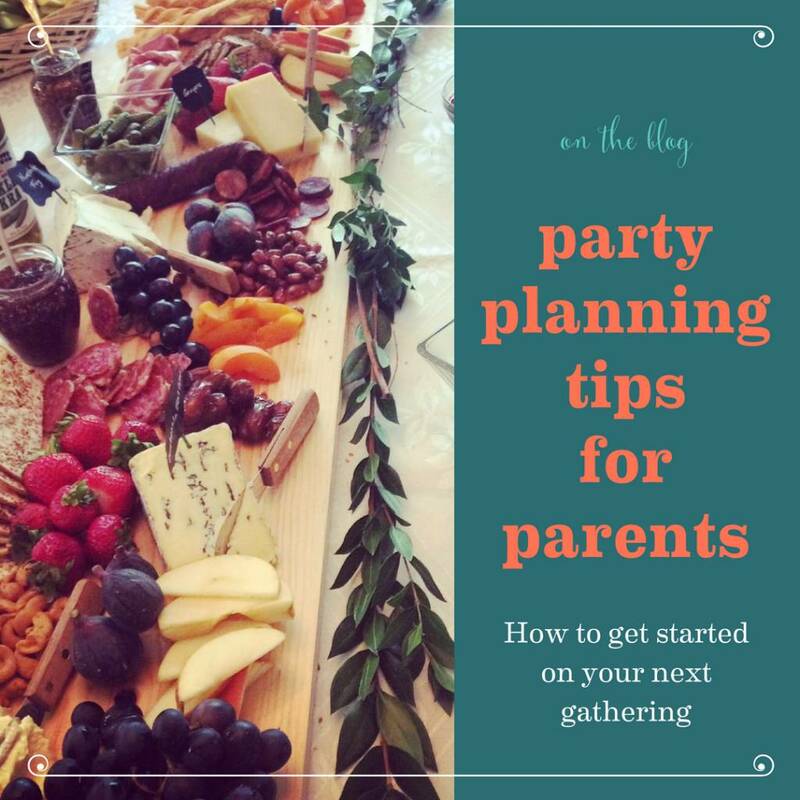 We asked a local party-planning team to come up with their list of tips for any parent hosting a party. When planning a party for your little one, don’t forget to consider nap schedules! If your child is the guest of honor, you want to make sure they are well rested and happy…because parties are exciting and can be exhausting! Don’t discount unlikely times. While an afternoon party may be more typical, a morning party can be a great time to get kids together. Very few parents of little ones have the luxury of sleeping in, so make the most of your day. The time of day you choose to have your party will also dictate if you’ll need to serve a full meal or just snacks. If you've thrown a party before, you know that food and beverages are the biggest portion of your budget. If you’re trying to save some money, your dollar will go a lot further with a breakfast or even a between meals time of day where you'll only need to consider snacks or cake. 2. Know your budget and stick to it (or beat it)! What budget? Many people go blindly into planning a party without having those $$$ in mind or even discussing it with their significant other. We often have to have conversations with Clients explaining why it's so important to determine what budget you are comfortable with spending. You do not have to spend an exorbitant amount of money to make your child happy. Sometimes less is more. Play a little game with yourself and write a dollar amount on a piece of paper with the absolute most you are willing to spend on the party. See if you can beat it by underspending. As your kids get a little older, they will help drive this decision, but when they are little, you will likely be the one choosing the party theme. Have fun with it; it doesn't always have to be Frozen or Sesame Street, even though we love those too! If you're just not sure, think about the ages of your guests, and find an activity that can help point you in the direction of a theme. If there will be lots kids, choose an activity appropriate for that age range that will keep them entertained. A petting zoo is great for all ages and lends itself to a farm themed party, or pony rides for a cowboy or cowgirl theme. For kids that are a little older, mini golf is unique idea and will keep them busy for a long time! We recently did a Master's Golf themed party and had mini golf set up and it was a huge hit. Will your guests be mainly adults…don’t sweat it! Do something that you enjoy…a tailgate themed football party, or a casual bbq. The key here is keep it personal and your child will have a blast just being with everyone they know and love. If your little one has an October birthday, why not capitalize on Halloween and let it guide your theme? Little ghosts and goblins would make for a not so spooky, but adorable theme for your little one's first birthday party! Can't you just see all of the babies hanging out in those sweet little costumes?! Plus it's an excuse to get one more use out of that costume! Depending on the formality of your party, your budget, and timing, you will need to decide what type of invitations to send. For the most casual and cost effective, there are many online/emailables options available that you can create and send to your guests immediately. This is great if you're a little behind in planning and need to get them sent out quickly. However, if you have the time and the budget, there are so many beautiful paper invitations, the options are almost endless. With the ease of online accessibility for talented artists that make custom invitations, you can be guaranteed that you will find a perfect invite that embodies your theme, color scheme, and your personal style! Are you a person who loves Pinterest and once you decide on your party theme, you start pinning away? Then you realize it is one week before your child's party and you couldn't execute all of your big ideas, and you're left feeling disappointed. Whatever you do, don't show your child the Pinterest Board when you're planning, as there's bound to be disappointment. Our advice about Pinterest is be realistic. Once you have your 50 pins, go back and start deleting ideas so you're left with what is truly manageable and keeps you focused. If you are unable to do this, get off Pinterest or consider hiring The Boastful Host and we can make your party hopes and dreams come true with no disappointment! Keep this tip in mind when it comes to any crafting that you may be facing this Halloween. Whether it's school parties you may need to volunteer for or even an adult party you may be hosting, simple is best! Unless you have skills like Martha Stewart, consider reviewing all craft instructions before you have your heart set on a certain idea that may be too difficult or time consuming to properly execute. There are so many cute and EASY ideas that you can pull together in an afternoon, if you keep your skill level in mind when building that awesome Pinterest board. Lists will ensure you're not forgetting anything, see if there are any areas where you may need to ask for help, and can help you keep track of your budget. We cannot stress this enough! You do not want to be scrambling the day of the party making a birthday cake and trying to set up decorations if they could have been done a day or so in advance. We provide all of our clients timelines with recommendations for when to start making the various items that will be needed for the party. This one takes some real planning, but you will be so thankful that you can relax a little the day of the party and enjoy playing with and seeing the joy on your babe's face. This may sound like a silly piece of advice if you think you'll be feeling overwhelmed preparing for your party, but it's truly the most important. If you follow the tips we've suggested, you should be very prepared come the day of your party. If you have any to-dos left lingering that morning, be realistic in terms of what you can really accomplish before guests arrive, and try to systematically address each task and cross it off your list. Beyond that, know that you've done your best and that no one else will know if a couple little details are missing. Children feed off of your energy, so if you're calm and ready to enjoy the day, they're more likely to enjoy it too. Your guests are looking forward to enjoying your company and celebrating the guest of honor, so focus on staying relaxed and having fun with them...if you can do that, then your party was a success! Celebrate Earth Day by Helping Kids GROW!